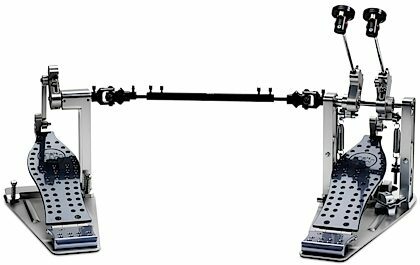 The Drum Workshop USA Machined Direct Drive Double Bass Drum Pedal is the first-ever DW direct drive double bass pedal and the only direct drive pedal on the market featuring Floating Rotor Technology, resulting in quick, smooth, responsive and powerful mechanics. DW Manufacturing made in the U.S.A. Boutique, precisely-machined pedals made from aircraft-grade aluminum in California. DW Manufacturing ushers in a new era in Drum Workshop's illustrious pedal-making history. Overall: This pedal is very light on your feet and very easy to control. The adjustments on the pedal are very easy to use. I had been using the DW 5000 pedal for a number of years and I loved it. This pedal is much easier to control with your feet, but it took me a couple of weeks practicing with it before I actually used it on a gig because it is a different feel. The only con is the price, very expensive!! Overall: This pedal is simply the finest pedal I have ever played and I own several top brands including Pearl, Tama, Trick and even other DW models and this one is super smooth and rock solid!!!!!! and zZounds is top notch as well !!!! !